Lake Country - Yellow Cutting Foam Pad 5.5"
Lake Country Yellow Cutting Foam Pad 5.5"
Lake Country CCS Yellow Cutting Foam Pad 5.5"
The CCS Smart Pads Dual Action 5.5 inch Professional Foam Pads are smaller versions of our 6.5 inch DA foam pads. The low profile 5.5 inch buffing pads pack the same CCS technology and performance into a compact, highly effective size that works best with dual action polishers and air sanders. 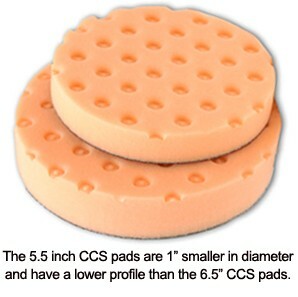 These CCS Smart Pads 5.5 inch Professional Foam Pads give you maximum maneuverability on your dual action polisher. Large foam pads tend to bog down DA polishers. Thatwhy 6.5 inch pads are the recommended size, but we streamlined the dual action buffing pad even more with the CCS Smart Pads Dual Action 5.5 inch Professional Foam Pads. These compact pads give the dual orbiting head even greater freedom of motion to help you work efficiently and effectively. Orange Low Profile Light Cutting 5.5 inch Foam Pad - Firm, high density foam for scratch and defect removal. Use this pad with polishes and swirl removers. Itan all around pad that will work on most light to moderate imperfections. Pink Low Profile Cutting/Polishing 5.5 inch Foam Pad - This foam is of medium density with the ability to level very fine scratches and very light oxidation. Use light swirl removers with this pad. White Low Profile Polishing 5.5 inch Foam Pad - Less dense foam formula for the application of waxes, micro-fine polishes and sealants. This pad has very light cutting power so its perfect for pre-wax cleaners. Gray Low Profile Finishing 5.5 inch Foam Pad - Composition is firm enough to withstand added pressure during final finishing to remove buffer swirls. It has no cut and will apply thin, even coats of waxes, sealants, and glazes. Blue Low Profile Finessing 5.5 inch Foam Pad Ã¢â‚¬â€œ Flat pad has soft composition for applying glaze, finishing polish, sealants, and liquid waxes. Flat pad provides full contact with paint surface to minimize the pressure applied by the user. Gold Low Profile Super Soft Jewelling 5.5 inch Foam Pad -Use the gold pad to apply a very fine polish or glaze as the final step of the polishing process. Jewelling is the term coined for this step because it intensifies gloss and reflectivity, like a jewel. The gold foam pad also works well for wax and sealant application. Lake Country CCS Yellow Cutting Foam Pad 5.5" Use this pad to apply compounds or polishes to remove severe oxidation, swirls, and scratches. It is the most aggressive and should only be used on oxidized and older finishes. Always follow this pad with an orange or white pad and a fine polish to refine the paint until it is smooth. Why CCS Technology CCS (Collapsed Cell Structure) pads were developed after more than two years of development with automakers and polishing companies. The result of this development was the patanted Collapsed Cell Structure technology. The basis of this technology is a pattern of strategically placed pockets on the surface of the pad. In these areas the cells of the pad have been closed. As a result polish does not soak into the pad like conventional pads, meaning the polish is able to work for longer. The CCS Smart Pads Dual Action 5.5 inch Professional Foam Pads are smaller versions of our 6.5 inch DA foam pads. The low profile 5.5 inch buffing pads pack the same CCS technology and performance into a compact, highly effective size that works best with dual action polishers and air sanders. CCS stands for Collapsed Cell Structure. CCS Technology is Lake Countryinnovative pad design that saves product by controlling product release onto the work surface. Dozens of dimples in the foam collect excess polish and reserve it until it is needed on the padface (the area that is in contact with the paint). This design prolongs your working time and reduces product waste. CCS Smart Pads work on every type of paint, from conventional clear coats to the harder, scratch-resistant clear coats used by Mercedes Benz and the Ford Motor Company. Lake Country's range of foam compositions, combined with the right chemicals provides you with a prescription to correct almost any paint imperfection on any paint finish. What are the benefits of CCS Technology? Slows rate of polish absorption As discussed above, the pads are slow to absorb products and therefore the paint benefits from a longer working time. The same is true of liquid waxes and sealants. Improves operator control CCS pockets gradually release polish as needed by the operator. Since these areas are not absorbing polish, they serve as little reservoirs until the excess polish is needed. Prevents pad skipping CCS pockets reduce surface tension allowing the operator to run pad flat on a working surface. Basically, the CCS pockets break up the smooth surface of the foam to eliminate the sticking and skipping that occurs when two perfectly flat surfaces meet. Creates less heat CCS pockets provide several points where the foam is not completely touching the paint. This reduces friction and therefore heat generated between the pad and the paint. OEM approved - OEM tests confirm CCS pads out-perform convoluted pad designs. CCS foam pads provide ample surface contact to effectively work the paint. 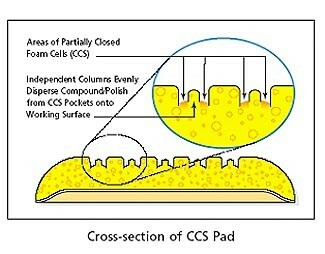 The CCS pockets are small so they don't affect the amount of foam continuously touching the paint during operation. These CCS Smart Pads 5.5 inch Professional Foam Pads give you maximum maneuverability on your dual action polisher. Large foam pads tend to bog down DA polishers. Thatwhy 6.5 inch pads are the recommended size, but we streamlined the dual action buffing pad even more with the CCS Smart Pads Dual Action 5.5 inch Professional Foam Pads. These compact pads give the dual orbiting head even greater freedom of motion to help you work efficiently and effectively. The CCS 5.5 inch Foam Pads are also a perfect fit on orbital air sanders with a 5 inch backing plate. Each CCS pad features VELCRO brand hook and loop fasteners covering the entire back of each pad to secure to a hook and loop backing plate. 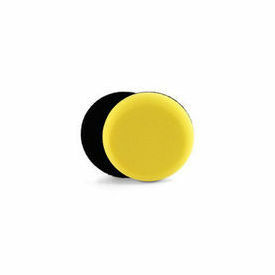 Yellow Low Profile Cutting 5.5 inch Foam Pad - Use this pad to apply compounds or polishes to remove severe oxidation, swirls, and scratches. It is the most aggressive and should only be used on oxidized and older finishes. Always follow this pad with an orange or white pad and a fine polish to refine the paint until it is smooth. Orange Low Profile Light Cutting 5.5 inch Foam Pad - Firm, high density foam for scratch and defect removal. Use this pad with polishes and swirl removers. Itan all around pad that will work on most light to moderate imperfections. Pink Low Profile Cutting/Polishing 5.5 inch Foam Pad - This foam is of medium density with the ability to level very fine scratches and very light oxidation. Use light swirl removers with this pad. White Low Profile Polishing 5.5 inch Foam Pad - Less dense foam formula for the application of waxes, micro-fine polishes and sealants. This pad has very light cutting power so its perfect for pre-wax cleaners. Green Low Profile Polishing/Finishing 5.5 inch Foam Pad - Use this foam to apply one-step cleaner waxes. It is a balance of polishing and finishing that is perfect for all-in-one product application. Gray Low Profile Finishing 5.5 inch Foam Pad - Composition is firm enough to withstand added pressure during final finishing to remove buffer swirls. It has no cut and will apply thin, even coats of waxes, sealants, and glazes. Blue Low Profile Finessing 5.5 inch Foam Pad Ã¢â‚¬â€œ Flat pad has soft composition for applying glaze, finishing polish, sealants, and liquid waxes. Flat pad provides full contact with paint surface to minimize the pressure applied by the user. Red Low Profile Ultrasoft Wax/Sealant 5.5 inch Foam Pad - This soft, imported foam is ideal for applying the final coat of wax or sealant. The foam works especially well when applying liquid waxes or sealants because it is firm enough to keep the majority of the product on the paint, rather than soaking it up. The red foam has no cut or cleaning ability. Gold Low Profile Super Soft Jewelling 5.5 inch Foam Pad -Use the gold pad to apply a very fine polish or glaze as the final step of the polishing process. Jewelling is the term coined for this step because it intensifies gloss and reflectivity, like a jewel. The gold foam pad also works well for wax and sealant application. CCS Technology is the future of foam buffing pads. These pads are easy to use, they improve operator control, they prevent product waste, they reduce heat...CCS pads simply do more to improve detailing results. To clean all foam pads: 1.Use diluted APC or soap solution and spray on the pad or2.Put your used foam, wool and, microfiber pads in the bucket and allow them to soak for up to 15 minutes. Use a Foam Conditioning Brush to agitate the pads while they soak. You can also use a light tootbrush3.Rinse the pads thoroughly and lay them out to air dry Rinse the pads and lay them flat to dry. Lay the pads foam side down. If foam pads are left to dry with the hook & loop facing down, water will settle where the hook & loop is glued to the foam and it may affect the glue. For the best results, lay pads foam side down so water drains down and out of the foam.